The Chamber choir is a mixed choir with about 40 singers. The Chamber choir was founded in 1964 and was in 2001 merged with the Vocal ensemble (founded in 1978). 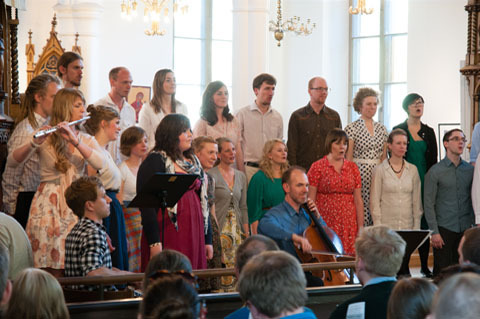 The Chamber choir rehearses every Thursday evening and is led by Sara Kollberg. Sara is educated at the Academy of Music and Drama in Gothenburg, Birmingham Conservatoire, the Kappelsberg Music School and the Ljungskile folk high school. She is also a singing and choir teacher at the high school. In the years between 2006 and 2012 Sara lived in England where she first studied and later worked as singing teacher in Stratford-upon-Avon and in Birmingham, where she also sang in different choirs. Today Sara conducts the Chalmers Chamber Choir since January 2016 and in addition to that she also conducts the ladies choir of the University of Gothenburg, Stella Academica. In her spare time she sings in the choir Gothenburg a Cappella.